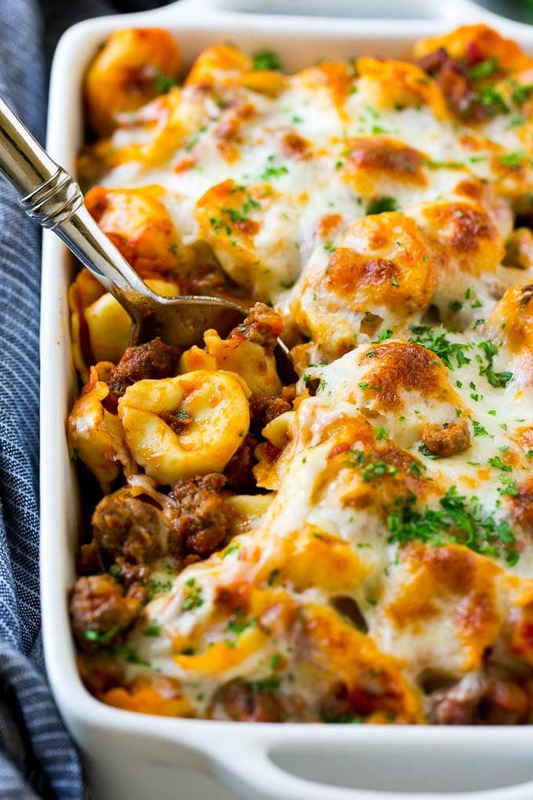 Baked pasta is classic comfort food that’s always a crowd pleaser. 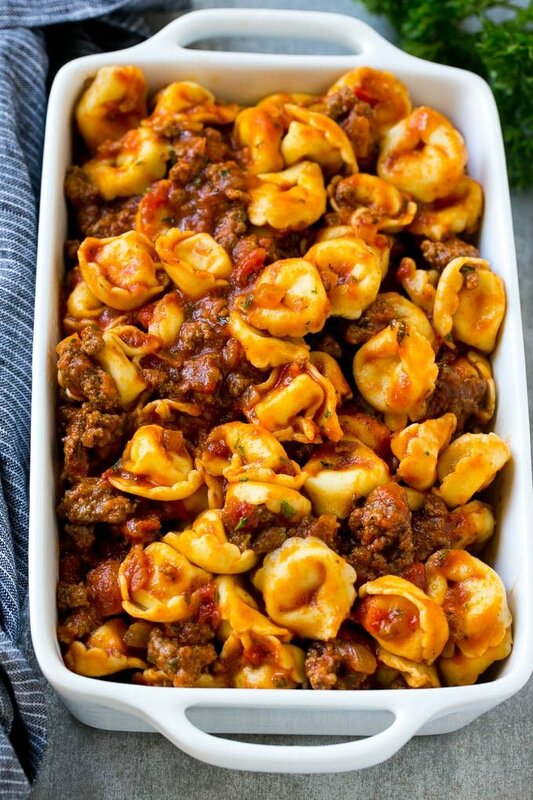 This version uses tortellini in a homemade meat sauce and can easily be doubled to serve a large group. I’ve been adding some new dinner options to our menu rotation lately, and this baked tortellini definitely fits the bill! 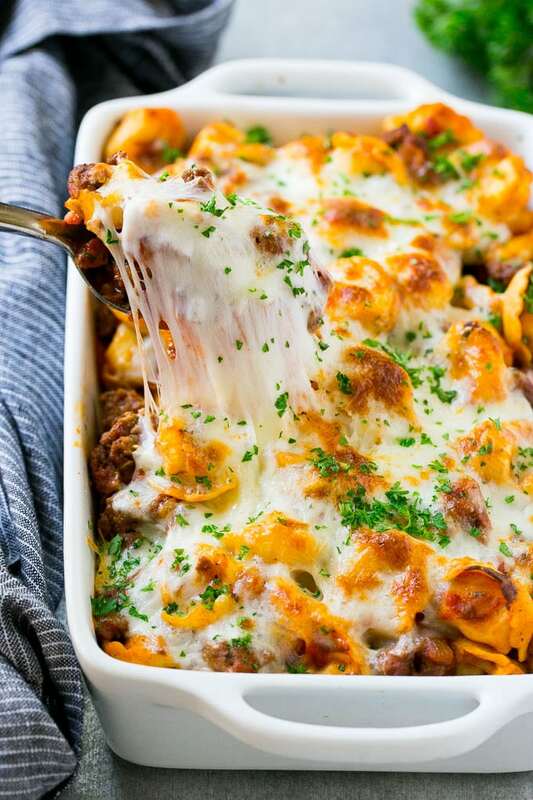 It’s cheesy, hearty, kid pleasing, and so very easy to make. All you need is a handful of ingredients and about 15 minutes of prep time to have this comfort food classic on your table. How do you make baked tortellini? This baked tortellini recipe starts with Three Bridges Triple Cheese Tortellini and Heirloom Marinara Sauce. 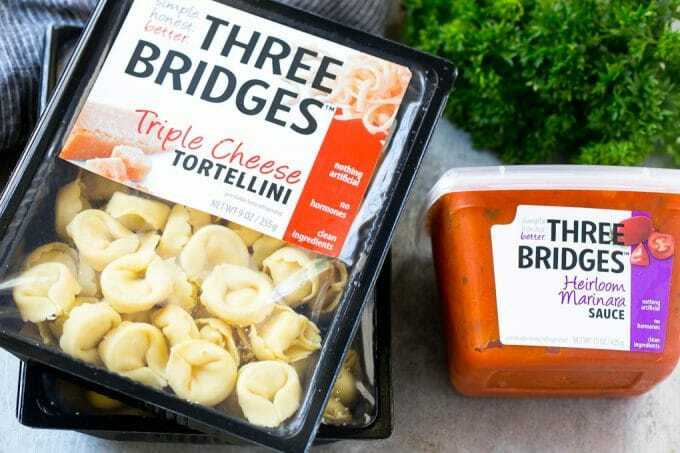 Three Bridges pastas and sauces are available at natural food and grocery retailers nationwide. I found Three Bridges at my local Safeway, but they’re also available at Raley’s, Target and more. The first step in the process is to bring a pot of water to boil. While the water is boiling, I sauté some diced onion and ground beef. After the tortellini goes into the pot, I add the Heirloom Marinara Sauce to the beef mixture. After the tortellini goes into the baking dish, simply top with shredded mozzarella, bake, then serve! How long does it take to cook frozen tortellini? I typically make this dish with fresh tortellini, but you can also use frozen tortellini with excellent results. Fresh tortellini takes about 6-7 minutes to cook, and frozen tortellini takes 10-11 minutes to cook. My whole family loves this baked tortellini, and I love how easy it is to make. It’s the perfect meal for a busy weeknight, or you can make a double batch and serve it up at a potluck! Regardless of how you serve it, it’s sure to be a hit with both kids and adults alike. Preheat the oven to 400 degrees F. Coat a 6 cup or larger baking dish with cooking spray. Bring a pot of water to a boil. Cook the tortellini according to package directions. While you wait for the water to boil and tortellini to cook, heat the olive oil in a large pan over medium high heat. Add the onion and cook for 3-4 minutes or until softened. Add the ground beef to the pan and season to taste with salt and pepper. Cook, breaking up the meat with a spatula, until done, approximately 4-5 minutes. Pour the marinara sauce into the pan with the beef and heat until warmed through. Drain the pasta and return to the pot. Pour the sauce over the pasta and toss to coat. Spoon the pasta into the prepared baking dish and sprinkle the cheese over the top. Bake for 20 minutes or until cheese is melted and starting to brown. This post is sponsored by Three Bridges. Thank you for supporting the brands that make Dinner at the Zoo possible! This is delicious and so easy to make! Big hit with everyone! Sounds amazing I’m so glad you enjoyed it! This was so very good . Family loved it. Easy to make in a tight schedule world we live in. Thanks so much for reporting back, glad you enjoyed it! Good dish! I’m a sauce lover so I doubled the sauce! I used a Sunday gravysauce which is identical to most heirloom sauces. Added a bit of garlic,Worcester, and a good balsamic vinaigrette. A touch of all three! 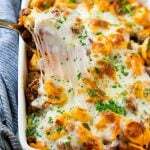 Perfect casserole that can be made ahead! Love all that melted cheese! 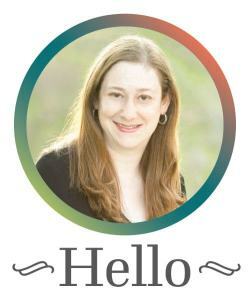 Hi Sarah, have you looked at their store locator? https://threebridges.com/store-locator/ I hope you can find it near you, it’s totally worth it! My family would just love this! Making it this week! This looks like the BEST dinner ever and I love how easy it is. Making this this week for SURE! I wish I had made this last night so I could bring the leftovers to work for lunch!